Global Employee Health & Fitness Month (GEHFM) is an international and national observance of health and fitness in the workplace. The goal of GEHFM is to promote the benefits of a healthy lifestyle to employers and their employees through worksite health promotion activities and environments. At the National Coalition for Promoting Physical Activity, our vision is that one day everyone will be physically active, and they will live, WORK, and play in environments that facilitate regular physical activity. The CEO Pledge for physical activity is our global initiative to encourage every CEO to recognize physical activity as an important driver of employee health and business performance. As providers of workplace wellness programs, employers have a tremendous opportunity to help their employees see the value of adopting healthier behaviors so they can live healthier lives. Studies of employee wellness programs consistently find that executive leadership is critical to employee engagement. If employees believe creating a culture of physical activity is an executive priority, employees are more likely to be physically active. During Global Employee Health and Fitness Month, show support for workplace wellness and take the CEO Pledge for Physical Activity. Encourage your organization to create an active working environment and provide opportunities for its employees to be active throughout the workday. 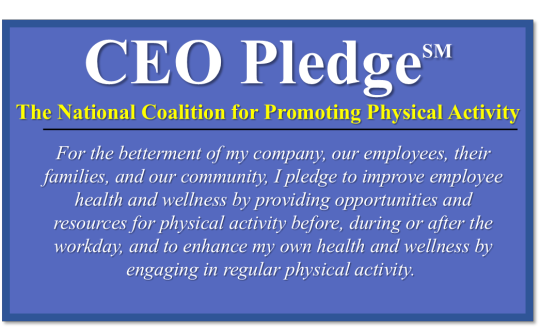 To learn more about the CEO Pledge for Physical Activity, visit the National Coalition for Promoting Physical Activity website.